Collingwood, in Southern Ontario about two hours from Toronto, is a popular small town that has a plethora of activity. Collingwood's Blue Mountain resort and location on the shores of Georgian Bay and at the foot of Blue Mountain gives visitors easy access to skiing, golf, mountain biking and much more. Collingwood is in Southern Ontario on Georgian Bay. Collingwood is about a two-hour drive northwest of Toronto or four hours from Buffalo. Collingwood is part of the South Georgian Bay area and accessed by several major highways. Collingwood is probably best known in Ontario as a ski resort town. Alterra Mountain Company (also the owner of Mont-Tremblant in Quebec) operates Blue Mountain ski resort in Collingwood, which is the city's main draw. More than a winter destination though, Blue Mountain and Collingwood attract visitors year-round, with excellent hiking, mountain biking, nearby beaches and water sports, zip line, golf and more. Scenic Caves Nature Adventures is a local company that offers visitors the opportunity to experience natural wonders through education, environment and leisure activities, like ziplining, treetop canopy walks, caving, snowshoeing and cross-country skiing. Downtown Collingwood is about a 10-minute drive from Blue Mountain. Before choosing your accommodation, decide what your accommodation priorities are and how much you want to spend. 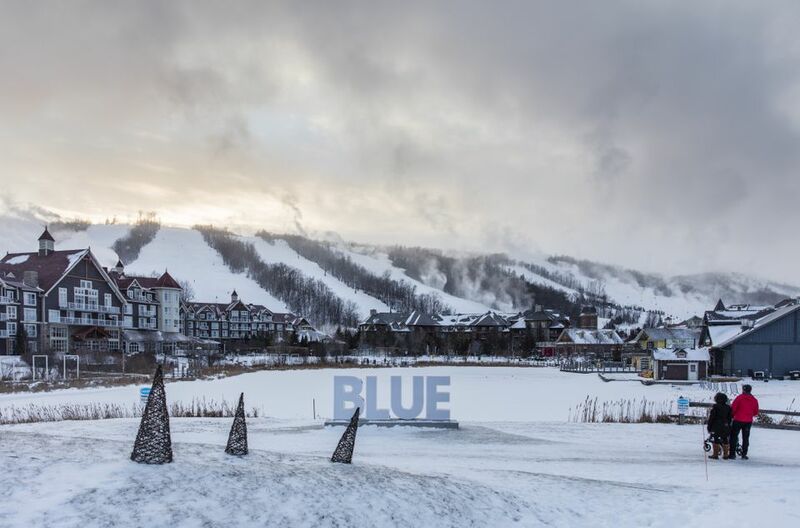 If you want the easiest access to the ski hills and the pedestrian village, you can choose to stay at Blue Mountain Resort. If you don't mind driving to Blue Mountain, perhaps you'd prefer a hotel in the town of Collingwood, which will probably be less expensive. When you book a stay at Blue Mountain, whether online or by phone, your accommodation will be selected based upon your preferences from a pool of Intrawest properties, including the Blue Mountain Inn, slopeside condos, mountain homes, and village suites. Most of the people skiing in Collingwood are from Ontario. Despite being one of the largest and busiest ski resorts in Canada, the "mountain" in Blue Mountain is really more of a large hill, with a summit elevation of 1,482', vertical Drop of 720' and 251 skiable hectares. Nevertheless, Blue Mountain is busy not just because it's one of the only shows in town; major renovations, including upper hill expansion, four new chairlifts and a transformation at the mountain-base village in 1999 when Intrawest - a major alpine developer - purchased the property substantiate Blue Mountain as one of Canada's most popular ski destinations. Collingwood has preserved much of the charm of its main drag, Hurontario Street, which has lots of unique shops instead of a barrage of franchises (OK, there's a Tim Horton's but this is Canada). Architecture lovers will enjoy a walk along Hurontario Street and a poke around some of the surrounding neighborhoods to see turn-of-the-century Victorian and Edwardian inspired architecture. Foodies and other shoppers will enjoy the stores, boutiques, and restaurants along one of Ontario's best preserved main streets. Toronto is the nearest international airport to Collingwood. Hwy. #400 north to Barrie. At Barrie take the (Exit 98) Bayfield St. (Stayner/Wasaga Beach-Hwy 26/27) cut-off. Turn left at lights onto Bayfield St. following (Hwy 27/26 West) signs. Travel north on Bayfield St. (Hwy. #27/26) through fast food alley. Turn left at (Hwy 26 West Stayner/Collingwood) sign. Follow Hwy 26 to Stayner. Staying on Hwy 26 turn right at lights (Esso Gas Centre) in Stayner and continue along Hwy 6 to Collingwood. Greyhound buses go to Collingwood, however, travel times may be longer due to transfers. Summerbound tour operator has a shuttle service between the Toronto Int'l Airport or Toronto and Collingwood.